In the split year 1931-32, One Hour With You was one of the eight films in contention for the best picture Oscar. Now that I've seen it, I only lack two films from that year's list to have seen all eight. One Hour With You shares a distinction with that year's best picture winner, Grand Hotel: In both cases, the best picture nomination was the only nomination each film received. That's the only time a film won best picture on its sole nomination. 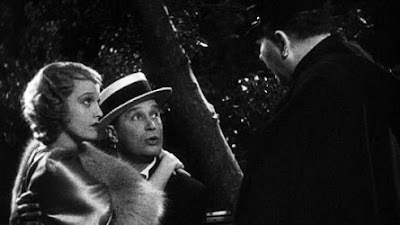 Anyway, I'm here to discuss One Hour With You, an amusing and watchable little trifle that was intended to be George Cukor's directing debut, though Paramount insisted that the great Ernst Lubitsch supervise his work. Apparently, Lubitsch and star Maurice Chevalier found something to be dissatisfied in Cukor's direction and Lubitsch took over so the final credit reads Directed by Ernst Lubitsch with the line Assisted by George Cukor in smaller print below on the same title card. Based on a play by Lothar Schmidt, One Hour With You was one of four musical comedies in which Lubitsch directed Chevalier (and three of those also co-starred Jeanette MacDonald). It's a delightful pre-Code marital farce which also features fine support from Genevieve Tobin, Charlie Ruggles and, most especially, Roland Young. The plot revolves around a happily married couple (Chevalier, MacDonald) living in Paris and still madly in love with one another, even getting carried away on a park bench and getting caught by a policeman who warns Chevalier that they can't make love there to which MacDonald replies, "He can make love to me anywhere," exciting her husband at the prospect. As I said, this was a pre-Code musical. Chevalier plays Dr. Andre Bertier and MacDonald is his beloved Colette. Near the film's opening, Colette can't hide her excitement about an impending visit from her best friend Mitzi Olivier (Tobin), unaware that Mitzi has never heard the word monogamy, much to the chagrin of her professor husband (Young) who has hired a detective in hopes of catching her in the act of cheating so he can divorce her. Adding another layer of complication, though mostly of the humorous kind, is that Andre's best friend Adolph (Ruggles) longs for Colette, but can never bring himself to make a move until he sees Mitzi start chasing Andre and believes that Andre will stray from Colette, giving him an opening. The trio of men in this lust pentagon really spark the film, particularly Young, who gets many of the best lines. When he's meeting with the detective, he points to a portrait of Mitzi with blonde hair. "When I married her she was a brunette, now you can't believe a word she says," the professor tells the detective. Later, spying what he thinks is Mitzi sneaking off with a lover, he confides to another, "In Switzerland, they have a very peculiar law that if a husband shoots his wife, he goes to jail." As you would expect, many complications ensue, especially once the Bertiers hold a dinner party and the various pursuers and pursuees clamor about the place, often in song and always in service to that Lubitsch touch. One recurring piece of business that stands out as unusual for this type of film is the breaking of the fourth wall. Sure, some film comedians did it at the time (I'm thinking Groucho), but it surprises you when Chevalier's Andre does it and he does it throughout the film (joined later by Colette). Before the guests arrive, Ruggles gets a funny bit where he phones Colette, slowly working up more and more courage to address his true feelings, and informs her that he's coming dressed as Romeo, as in Romeo and Juliet, only to be informed by his unrequited that it's not a costume party. When he hangs up, he angrily confronts his butler Marcel (Charles Coleman) and asks why he told him it was a costume party if it wasn't. "I so wanted to see you in tights," Marcel confesses. Nearly all the songs have lyrics written by Leo Robin while the music for most were composed by Oscar Straus with the exception of the title tune which had music by Richard Whiting. One Hour With You, which has a screenplay credited to Samson Raphaelson, even has large sections of dialogue that rhyme even though there isn't any music in those scenes. One Hour With You isn't a great film, but it does entertain (which is more than I can say for a couple of 2010's 10 nominees) and though I still have two 1931-32 nominees to see (Bad Girl and another Lubitsch/Chevalier musical, The Smiling Lieutenant), I think they might have made the right choice with Grand Hotel (though it's a close call with Shanghai Express). I've always wanted to see this film, and your write up has cemented my resolve. I will watch this! Bess Flowers was famous for being a background player in a few bajillion films. It's kind of a sport to some of us, watching for a Bess Flowers sighting. She always seems to be a party guest, in a club or a restaurant. She's very visible in "She-Creature", if you're looking for a movie where you can see her easily.